Last month I started a project in which I walk more systematically from 9th Street south, on every block between Fifth and Third/Second. I think I'll take this through Sunset Park. This is a good project for winter weather, as I can just walk out of the house and do a few blocks at a time. The farther south I get, especially if the weather's bad, I can get lazy and bus it down. I know these streets well enough, but only in a random way. Walking it block by block you trace again and again the repetitive sweep of the streets down to the water. Down streets where housing predates the sober conformity of identical rowhouse, and instead offers a random assortment of age, style, shape, size. Streets that could lead to a world of ferry crossings. Blocks (still) broken up by any number of small businesses - tile, marble, plumbing, poultry market, auto repair - and where, as you glance downhill, under the Styx of the expressway, you can see ships, and water. As you walk you also see on almost every street the freshly painted clapboards of a new renovation, a new apartment building, clad in dull, smooth brick, or glass and steel, and at least one empty, waiting lot. The poultry market building on 20th Street. More pictures here. 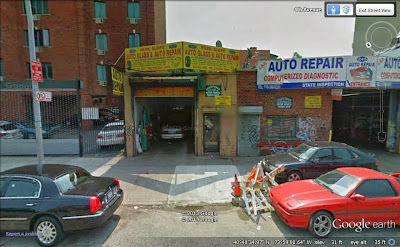 Today we turn our attention to Fourth Avenue, where yet another auto shop - Park Slope Auto Glass & Auto Repair - is up for grabs. The property comprises a 20' X 40' garage on a 20' X 92' lot. The price - $3,000,000. Clearly Christmas has taken its toll. Candy Land appeared in January, but didn't see the year out. When I walked by 7th and Fourth last weekend, the space was opened up into the laundromat next door. It had seemed like an over-ambitious venture from the start. Although there's a school across the avenue, it's hard to see how a regular candy store could survive on sweet sales alone these days - in this location at least - unless it had some special, upmarket spin. How many gumballs and sours to pay the rent in 2013? I'm sorry it failed though - the store owners were kind & hopeful & I wished they'd defied the odds. 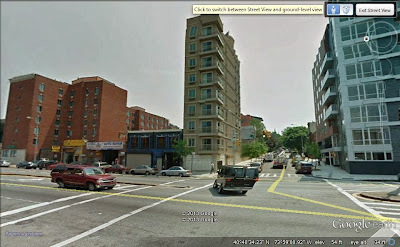 Next to Marble City, at 19th & Third, a triangular lot hugs the avenue. In it, there's a small brick building that looks like it could be some sort of utilities office. There are lights on inside, and the property is fenced in with serious looking ironwork. but the place is pretty run down, with a shrubby sapling rooted in the roof. What goes on in there? There's a Whole Foods walkway following the 4th Street Basin round onto a main stretch of the canal. It offers great views, but it seems like a strange world when we're looking out from supermarket parking lots at landscapes poised for extinction. The store itself is jam-packed with customers, and has specials a-plenty for opening week. Even I'm getting grabby with the half-priced cheese. Nearby, a sign proclaims, "Welcome to Gowanus, 2 Acres for Development, Land for Rent, 55,000 SF." On the waters of the basin, right next to Whole Foods, a floating Harvest Dome, constructed of reclaimed umbrellas and soda bottles. Easy consumption's the name of the game around here, no? You can still find the sublime without shopping for it though. Head down to 19th Street and take it as far west as you can. Ignore the No Trespassing sign at Vintage Foods and you're right at the water. Here canal meets Gowanus Bay. Here transcendence is all yours, with not another soul in sight. Here too, the landscape is fragile, but fleeting or not, its beauty will take your breath away. The gulls cry, the waters offer limpid, glowing reflections, and before you all the glories of sea, sky, highway, viaduct, crane, container rusted into dark gold, the hulking grain terminal, In the distance, a boat, the Hunting Creek (Baltimore, MD), slips slowly towards the sun-dipped horizon. We’ve lost our business,” said 63-year-old Sergio Olivio, holding back tears inside El Gran Castillo de Jagua. “I wanted to retire after finishing work here, but now it seems like I will have to work someplace else to make a living,” added Olivio, who said he plans to fight the expulsion in court. According to the News, no details about the developer-owner's plans for the site, which will displace at least five businesses - have been disclosed. An attorney representing Vlacke Bos wouldn’t answer questions about the plans, saying her client was flying internationally and couldn’t be reached for comment. Almost a parody of a statement, but no, that's the tone of things these days. After reading the story, I headed over to Little Miss Muffin 'N' Her Stuffin', one of the other businesses to be kicked out . The Trinidadian patty & muffin shop has maybe the best patties in the city (reliable patty experts bear me out on this), & has been serving them out (along with the muffins) for twenty years. At a couple of bucks a patty, this is affordable food for all incomes, an increasingly rare commodity around here The mood in the shop was somber. Little Miss M will be closing on December 28th. Hopefully, they'll be relocating to a different address, most probably on Washington, and if you go to visit soon (the jerk chicken patty is a thing of beauty) you can get on the mailing list to receive updates about their new shop. There's a long list of names & addresses already - testament to the love its customers feel for the place. But the whole deal here stinks - another story of small, family businesses pushed aside, replaced by the unremarkable, the unaffordable, the unspeakable. The true wealth of the city counts for nothing. Sundown. On a crowded N train, at a space by the door, nose against glass. Who could get tired of this? Sad news that The Red Horse café, at Sixth & 12th, closed over the weekend. This was a nice, unpretentious neighborhood cafe, with excellent coffee & a low-key, welcoming atmosphere. Good luck to Brent & family in their new business ventures. Back to the old White Eagle Tavern, at Fifth and 23rd, a remnant of the neighborhood's once thriving Polish community, and the subject of several earlier posts. Smolen, a block further north, turned into Mary's a couple of years back, but 724 has retained the White Eagle signage, even though the bar itself is long-closed. 724 has been in a state of dereliction for years, and its decline accelerated when Sandy swept through. This summer, 724 was sold to 724 Fifth Avenue BK LLC for $1,659,000, with the new owners planning enlargement and conversion of the building. Open violations include failure to maintain (hazardous structural conditions and debris), and unauthorized concrete work and steel reinforcement is indicated on a work permit. A staircase with dramatic street views, a rooftop garden and a major glass atrium are key features of seven proposals for the controversial new Brooklyn Heights library. In February, Brooklyn Public Library officials announced plans to sell the city-owned branch at 280 Cadman Plaza West in Brooklyn Heights to a private developer who will erect an apartment tower with a new, 20,000 square foot branch on the bottom floor. Library officials unveiled renderings from the seven finalists on Thursday. The plans all varied in size and scope. “I think it’s a very compelling project,” said library vice president Joshua Nachowitz. Squeaking in a few days late. Last week I took a look at construction work on two sites at 20th Street. The developers for both properties appear to be the same ones working (from time to time) next door to us. 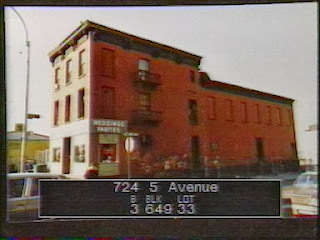 The bigger site, a double lot at 320 & 318, was sold in late 2012 for almost a million dollars. A bargain, perhaps. 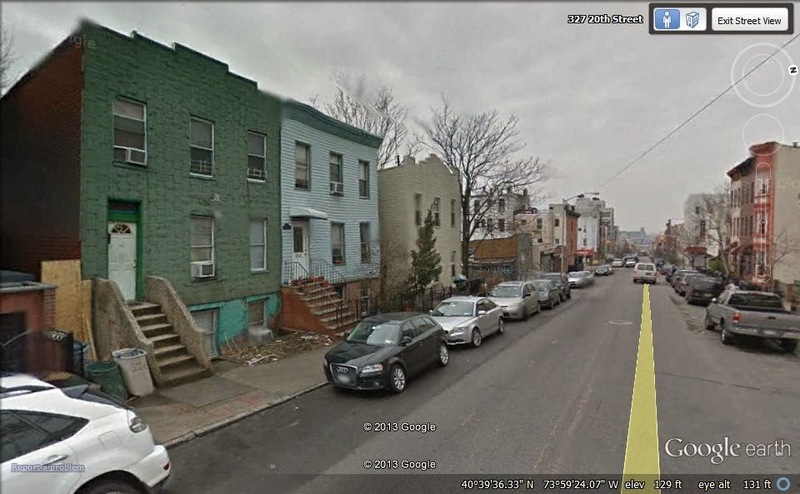 Massey Knakal is currently listing for sale two adjoining houses just up the block at 324 & 326, & this tasty parcel (50' X 100') is up for grabs at $2,750,000. The two houses in question are below, at left. "The site is an ideal development for two contiguous townhomes or a rental/condo development. On a quiet block that opens towards a view of the Statue of Liberty, the subject site is situated close to two large scenic attractions, Prospect Park and Green-Wood Cemetery, a National Historic Landmark. 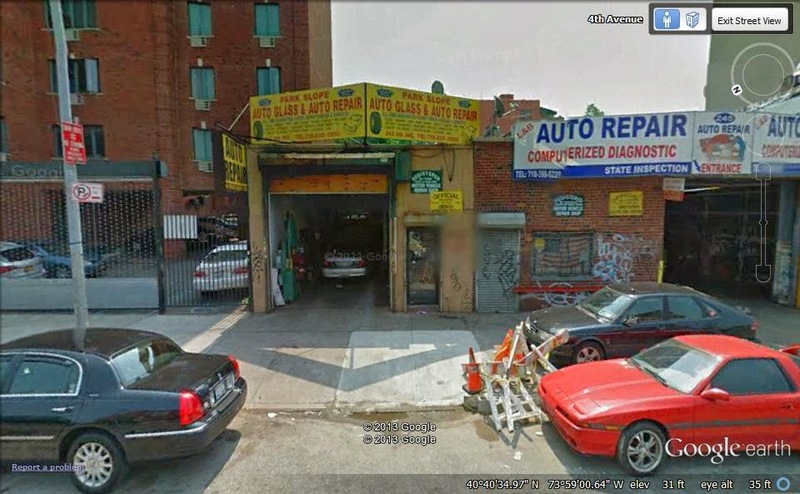 The property is conveniently located just steps from the Prospect Avenue (R) subway stop, the 15 Street–Prospect Park (F & G) subway stop, and the Prospect Expressway." This will leave 322 sandwiched between penthouse-embellished buildings, and cast into shade. Up on its roof, no chance of even a tiptoe view of a lady with a torch. Massey Knakal are the brokers handling the sale of the Coignet Building (price undisclosed). No More Ackee & Saltfish? The Jamaican café at Fourth & 10th was shuttered up today. It seems to have been languishing ever since it opened, and I wish it would get/could have got its message across more boldly, because the food is/was actually great. Huge helpings of goat, oxtail, jerk chicken, with rice & peas & the works, for ten bucks. Best of all, for the same price, the elusive but delicious ackee & saltfish. Negative factors at work here: the dreary name of the place, Slope Café, which does not/did not capture the spirit of its fantastic food, and the store space itself being rather too big. It looked a little glum from outside, and didn't manage to draw new people in, though its customers were loyal. Its situation is good from a foot traffic aspect (right by the subway), but bad because the building it's in is on a worst landlord list. Hmm. I wish the guys would find a smaller spot nearby, get some better promo, and give it another shot. There's no West Indian food anywhere nearby, and this is the real deal . Too many mixed tenses here, but I'm hoping that this was just a temporary closure, and if I'm right, go & eat there. And demand the saltfish back in the regular rotation..
Update (Sunday): Looking more & more like a permanent closure. 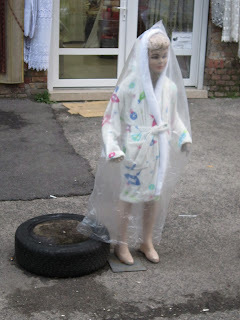 Romy Ashby's latest essay at Walkers in the City: "Steve and Yuko"
Real Estate Monday will return next week. Adam Fleming and Julia Sommer were surprised by how much they loved Brooklyn. Mannequins appear quite often here. I'm rather partial to them. Up to this point. they've all been New Yorkers, but here's a Hungarian, sent to me by Carl Douglas, who is still at large in Central Europe. Even by my warped standards, I find this one creepy.